Ekman had been an actor already as a boy in the 1920s, but he wrote and directed his first film in 1940. In all he made 41 feature films and one TV-series, Niklasons (1965), before he retired. He was at his best from 1943 to 1954 and the majority of the chosen films were made during those years. There are also two earlier films and one late film (which is also the only one in colour). I thought I say a few words about why I have chosen these ten in particular. Första divisionen / The First Division (1941) was Ekman's second film, set on an air field in the north of Sweden and it is a tense drama with exhilarating flying sequences. It is not a war film, and no other countries are mentioned, instead it is focused on the lives of the pilots. I chose it partly because of the quality of the cinematography and partly for it is unusual for Ekman to make a film not set in downtown Stockholm. It shows the range of his talents. It is also well-acted. 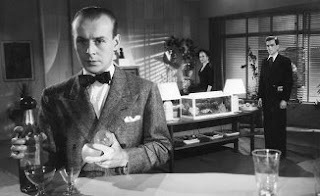 Lågor i dunklet / Flames in the Dark (1942) is a psychological thriller about a cruel, sadistic Latin teacher, played by Stig Järrel, which makes it impossible not to compare it with Hets / Torment (Alf Sjöberg 1944), where Järrel plays almost the same character. While hardly Ekman's best film, it is a showcase for Järrel (who acted in most of Ekman's films during the 1940s) and it shows Ekman trying to find his style. Ombyte av tåg / Changing Trains (1943) is the film I consider Ekman's artistic breakthrough. It is when most of what is typical of his work first came together, a theatre setting, a sombre mood, a subtle love story and with an autobiographical background. It is not a linear story but fragmented and open, moving between different characters and back and forth in time. It was also the first time he worked together with writer Walter Ljungquist. In addition, Göran Strindberg's cinematography shows the influence of French poetic realism. 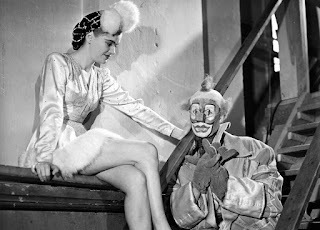 Kungliga patrasket / Royal Rabble (1945) is based upon Ekman's own family and a life at the theatre. It was the first film of his in which Eva Henning played a role (although they had acted together the year before in Stopp! Tänk på något annat (Åke Ohberg 1944), a fine film too). The acting and the compassion with which all the various characters are portrayed is wonderful and while there is tragedy here, it is primarily a love letter to the theatre, and all those people who are part of it. Vandring med månen / Wandering With the Moon (1945) might be my favourite of all of Ekman's films. Working closely with Walter Ljungquist, it is also the Ekman-film which most resembles the films of Jean Renoir; a lyrical tale of assorted people crossing paths during a few summer days. The spectre of Nazism is there, as a dark force in the shadows, but mostly it is a celebration of the loners and oddballs that live outside the mainstream of society, and Eva Henning plays a young actress exploring her sexuality with an immature young boy played by Alf Kjellin. Gösta Roosling's cinematography help bring out the film's lyrical aspect, with the sun and the moon glittering on the water or the leaves and the grass. Banketten / The Banquet (1948) is one of Ekman's darkest films about a wealthy family slowly unravelling. The father is tired and frustrated with life, his wife is living in denial about the problems they face, the older son is a decadent drunk, the younger son a communist and the daughter (Eva Henning) is trapped in a wretched marriage (her husband is played by Ekman). With the imagery of a film noir, it is both a domestic horror film and a comment about a changing society after the war. Flickan från tredje raden / The Girl From the Third Row (1949) is yet another of Ekman's loosely structured films about multiple characters who accidentally cross paths and with a theatre setting. It is also the film which Ekman called his "anti-Bergman film", a direct response to Bergman's Prison (1949), and intricately told. Henning plays the title role, and the film moves effortlessly from tragedy to comedy to nail-biting suspense. There really is no other film quite like it. Flicka och hyacinter / Girl With Hyacinths (1950) is undoubtedly Ekman's most famous film, beautifully shot by Göran Strindberg and brilliantly acted by especially Eva Henning. A feminist film, a film with a complex narrative structure and dealing with a number of sensitive issues, including Sweden's ambivalent role during World War 2 and its appeasement of the Nazis. A very sad film, it was Ekman's own favourite, a film he could barely talk about without getting tears in his eyes. Gabrielle (1954) is also a dark film, of a marriage falling apart due the jealousy of the husband. Told in flashbacks, both real and imaginary, it was made after Ekman and Henning's own marriage had ended in divorce. Henning plays the wife in the film, and Birger Malmsten the husband. The cinematography is by Gunnar Fischer. Med glorian på sned / The Halo is Slipping (1957) is something rather different. It is in colour and Ekman's first film in widescreen and it is one of four comedies Ekman made in the late 1950s with Sickan Carlsson, whom could be called Sweden's Doris Day. The last of the four is dreadful but the other three are a lot of fun, and while Fröken Chic / Miss Chic (1959) is my favourite this one comes second. They are about stuck-up men and independent-minded women, the commercialisation of radio, TV and publishing, and they have glorious set-pieces, The Halo is Slipping even has some surreal dream sequences. It is a lot more cheerful than the others in this retrospective and quite charming. So those were my ten. They are not his ten best, but most of his best films are among them and all ten are unmistakeably Ekmanesque. They show all aspects of his art; the style, the ear for dialogue, the love of the theatre, the view of life as a tragic comedy and the ability to draw out the best of his fellow actors. Would I be able to do another Ekman retro at MoMA in the future I would especially want to show Eldfågeln / The Fire-Bird (1952), if it has been properly restored by then. It was Ekman's first film in colour, a ballet film and an experiment with colours too, shot by Göran Strindberg. I initially wrote that Åke Dahlqvist was the DP on Wandering with the Moon, but that was of course wrong. Are you coming to NYC for the retrospective? I'm planning on catching most of the series. Yes, I will be there the first week. I would never know about Ekman if not for your site. However, I think I only have time for one of his films. Given such constraints, is WANDERING WITH THE MOON the one you'd recommend trying to catch? It's a difficult choice... Wandering... or The Girl From the Third Row or Girl With Hyacinths. Since Girl With Hyacinths is the one most people have seen, and everybody loves, it might be the safest bet!